CEC has performing some activities to disseminate information about IT-use education. Especially symposia in local areas and Tokyo metropolitan area are, having a quite lot of people related like teachers, staff of reagional board of educations, researchers, business people etc. are held effectively. Three Symposia were held in Kyoto Pref., Miyagi Pref. and Tokyo ｍetropolitan area. The outline of each symposium is as follows. Theme：　“Solid Academic Capabilities cultivated and sensed by IT"
Place：　Building No.3, Fukakusa Campus, Ryukoku Univ. Co-organizers：　Miyagi Prefectural Board of Education ,Sendai City Board of Education. Supporters: MEXT,Tokyo Metropolitan Governmental Board of Education,IPA,NIME, etc. As part of research activities requested by the Ministry of Education,Culture, Sports, Science and Technology , CEC conducts survey and research into "The improvement and development of educational software" and "The improvement on the training to deal with information." "Survey and research into the effective utilization of systems engineers and other non-teaching school staff"
"Notes on training curricula for computer-enhanced classroom teaching"
"Survey and research into measures to deal with the dark side of information education (harmful information, etc.)" "Survey and research into the creation of Internet guidebooks on morals and security"
"Study on impact of informatization on children(analysis of questionnaire survey) "
"Study on impact of informatization on children(Part1) (with a central focus on the tendency of use of the Internet)"
"Study on impact of informatization on children(Part2) (with a central focus on the tendency of use of the Internet)"
"Study on practical examples about information morals in elementary and secondary schools"
"Questionnaire survey on realties of information moral education in elementary and secondary schools"
In 1994, the Ministry of Education began dispatching systems engineers to schools, in an attempt to advance information education. 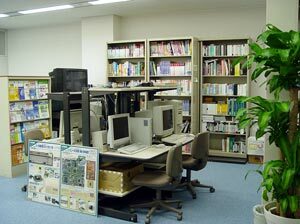 Systems engineers and other technical staff are sent to schools where they conduct training for teachers and provide classroom support, and advise at "the Educational software library centers" set up by the local education committees. Thanks to the cooperation of the supporting companies of CEC, we are building an extensive library of the most advanced education software from Japan and abroad, as well as putting together a collection of the latest PCs and peripheral equipment. Moreover, personal computers are provided to allow you to experience a variety of Internet applications. CEC has a library of about 1,200 commercial educational software titles. We have a full range of educational and teaching courseware as well as school administration software and overseas educational software. We provide experienced consulting on the use and assessment of computers in learning, guidelines for new information education, etc. 10:00 to 17:00, excluding weekends and public holidays.